Posted by Admin On October - 16 - 2018 Comments Off on Is Alderman Michelle Harris Trying to Destroy a Multi-Million Dollar Historical Landmark and Legacy in the 8th Ward, the Black Community? There are Some Who Think So. Is Harris the Best Person to Represent the 8th Ward Community? There Are Many Who Think Not! What is the agenda with black alderman on the South side that they allow outsiders to steamroll or buy them out so they can define and develop a community that doesn’t belong to them? They didn’t come running until the Obama library construction was announced. Black aldermen are allowing prime real estate to go down in value so it can be purchased at a low cost or grabbed by parasites buying and flipping property. Alderman Michelle Harris’ office had the Chicago Police Department storm troopers raid the front and back entrances with 20-30 officers according to an affidavit submitted by a producer during the filming of a gospel teen music video with “nine teen dancers, three parent chaperones and a video crew of seven people…19 in the audience chairs” there at the Avalon Regal Theater. Imagine the trauma the kids suffered, being inundated daily by media depictions of police violence against black youth. Amidst the chaos, over a half dozen police vehicles raced to the theater where potential visitors had gathered for an annual Chicago architectural tour. They stood in amazement to see signs stating that they were not permitted to enter. The annual Avalon Regal tour had been a part of the popular Architectural Open House Walk for the past three years without incident. 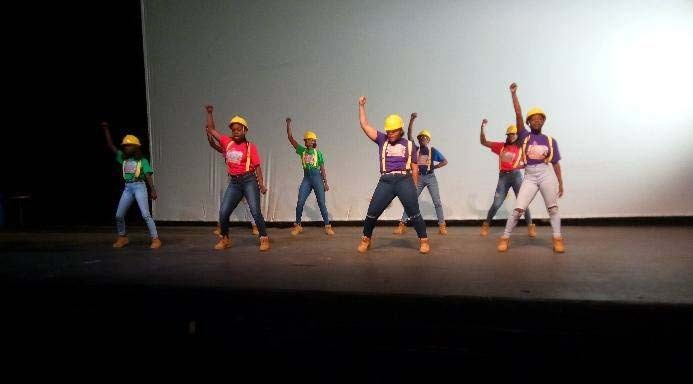 The long anticipated event was seen as a beacon of hope to raise awareness and possible contributions, for the minor repairs needed to allow the theater to be self-generating monetarily. During the encounter, witnesses say officers threatened to arrest everyone, including Ms. Peggy Sutton from Mayfair Dance Academy. Mr. Gary was taken into police custody and later released. No charges were filed. Unwarranted Raid: Mr. Jerald Gary‘s Avalon Regal raided by CPD. He Was Arrested! Reportedly someone said Harris’ office had called police on the owner of the Avalon Regal Theater. Kids were reported frightened “and it will probably have a mental affect on them for a long time.” What was she thinking!? If she was truly concerned as reported, was she not smart enough to consider the affect this scenario might have on the young people? However, she told CopyLine Magazine that she tried to help and work with him. She said it was a court order issued by the city. Although, Mr. Gary didn’t agree with her statement. Don’t let Alderman Harris’ personal agenda get in the way of a legacy that belongs to the whole community. Help Support the Avalon Regal Theatre and Mr. Jerald Gary’s efforts to revitalize the community starting with reopening the venue with concerts and plays that will also include a innovative cutting edge hologram technology of the greats performing. Imagine sitting back watching a Billie Holiday concert or Curtis Mayfield as others watched when they were in their prime. Nowhere else in the city, county or state is anything on this level being done. The Avalon Regal Theater is “uniquely positioned to serve Chicago’s South Side and Northwest Indiana. According to Mr. Gary, “It’s not just about entertainment, but education and community empowerment and development as well.” Avalon Regal is the largest venue in the region. Beautiful videos have been shot there with companies like Nike, Glade and others taking advantage of the opulent surroundings. UPDATE: Michelle Harris office is back paddling in Facebook wars after seeing the Sun-Times report that Super Star Kanye West is interested in helping the Avalon Regal Theater open back up. Kanye tweeted many of his followers about his support. Again, an opportunist like Harris has no interest in anything that helps the community unless it helps her. She obviously doesn’t care what it looks like unless she is shamed on social media as she has been intensively for the past several months with photos of blight and hopelessness in the 8th ward. Only then she jumps to some action. Everything that her opponent calls her out on, she is trying to fix only now, a couple of months before the election. She even went as far as to take photo opportunities with Kanye West and Jerald Gary and have them posted on Facebook. Could it be there was a spark when the Harris team saw one of her opponents, Linda Hudson in a photo visiting Mr. Gary and the Avalon Theater for the purpose of offering her support by taking a look around and posting his fundraising campaign link to encourage others to help out as well? 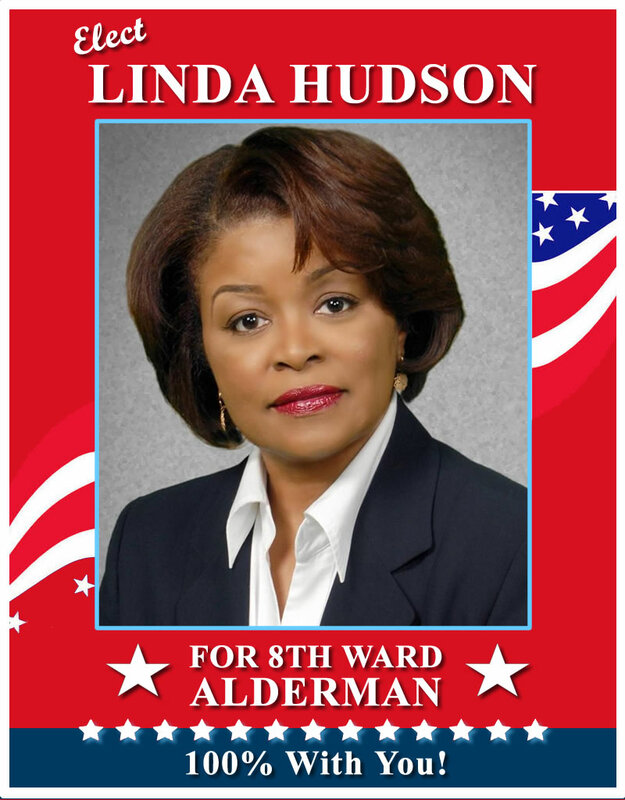 Missing from the photo-captions lauded by the Harris team on the incumbent’s Facebook campaign site, was that it was a standing (regular) meeting prior to her 8th Ward challenger Linda Hudson’s visit. Furthermore, “the meeting was with the City” to discuss the Landmark Commission’s involvement in the minor work to be done on the Avalon Regal Theater to open it up for public use. Kanye West was there with Jerald Gary because he will be playing a big part in helping to reopen the theater. This regularly scheduled meeting with the City was not a Michelle Harris meeting. Funny how it wasn’t mentioned in the photo credits that it was a Landmark Commission & City of Chicago meeting with the theater owner and his investor. Was it an oversight? I think not. Just another effort to fool the public into believing she was there to give her support to Mr. Gary. It’s said a picture speaks a thousand words. Gauging the expressions on the faces and the body language in the photos posted by Harris office definitely seem to tell a story all their own, and it’s not the one they are spinning. Photo from that day at the Avalon Regal Theater just before Chicago Police raided the place on false rumors that 400 people would be sneaked in the back door to raise money for the restoration of the place. Where is the water claimed to be pouring in on this rainy day as reported by Harris office? It doesn’t look like they are in dark rains here. According to this photo taken then, there are obviously lights on in the place too. Up next: How an alderman can “ghettofy” a middle class community with a mural and a low income housing project. The Queen obliterated genres. The Queen gave us deep feeling and meaning to all the harsh conditions we faced in America: a field holla goddess-like cry; dignity in the work songs; sweet joy in the morning spirituals; shouts-from-the-back-of-the-church gospels; deep moaning blues; jazz be-bopping; rhythm and blues doo-wopping. The Queen served up a healing/soulful polyrhythmic mix for our troubled souls. It is almost like each song the Queen delivered told a story about our journey to a foreign land, the horrors we would endure while at the same time giving us the strength to persevere. When we crossed the threshold at Goree Island, we had no idea we would be walking into an enslavement terror heretofore unknown to humankind. And once we were forced onto the ship called Jesus there was no mercy shown for the travails that lay ahead. The turbulence of the Atlantic waters tossed us about like rag dolls and we learned how to “ROCK STEADY” for our survival. We quickly recognized we would need to build a spiritual “BRIDGE OVER TROUBLED WATERS”. There were those of us who would rather die than be enslaved and threw themselves overboard. Historians have noted the shackled enslaved Africans still on board would murmur, “He gone home.” We could surmise: to find an ANGEL. Upon reaching the shores of Jamestown, VA all we could here from the slave masters’ bellicose commands was “JUMP, JUMP, JUMP TO IT”! As cold as winter in the colonies, we were stripped of our identities, culture, and religion. We would find solace in the warmth of our spirits and our ancestors. As Malcolm X would say, “Just because a cat has kittens in a stove, you don’t call them biscuits.” An AFRICAN IS STILL AN AFRICAN. In the Queen’s words, “A ROSE IS STILL A ROSE”. We took that to heart and would “SAY A LITTLE PRAYER” to call forth our heaven on earth — not in the bye and bye! With the civil war coming to an close, emancipation began swirling in the air. We wanted to believe we had a “DO RIGHT MAN” in President Lincoln and a “DO RIGHT WOMAN” in America. On both accounts, we were sadly mistaken and realized we were only a “CHAIN OF FOOLS”. We were turned back during Reconstruction, forlorn and bewildered – betrayed with the removal of all federal troops from the south. Forty acres and a mule was just DAY DREAMING. Consideration or discussions about reparations with America became, “DON’T PLAY THAT SONG”. Jim Crow swept across the land like boll weevil. Marauding gangs consumed with white nationalism punctuated the American landscape with “strange fruit”. Protests and marches ensued endlessly. We stood at the crossroads between violence and non-violence. Not fully recovered from the four little girls bombed in the Birmingham church; a shot rang out in Memphis, a body fell. The King of Love was dead. In total disbelief, we said, “AINT NO WAY”. The lyrics from ELEANOR RIGBY reverberated with us singing the chorus, “All the lonely people where do they belong?” The political milieu continued to offer a fox or a wolf. We turned to each other for support. It appeared as if our compass for moving forward had gone awry but there was a light at the end of the tunnel and it wasnt the train coming back at us. We elected the first African-American president. On that accord we demanded, R-E-S-P-E-C-T.
Just recently, the Queen was called home by her celestial designer – her maker, where she now joins the ancestors. Collectively, we all sighed. The fact is the Queen had fulfilled what she came here to do: to be of service; her divine purpose complete. I had one last request. I asked the Queen to “CALL ME” the second, the minute, the hour, the moment she get there. She did. Thank you QUEEN for the spiritual call back. 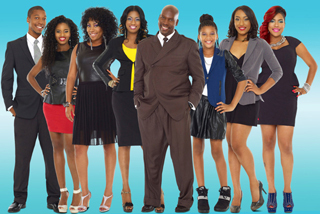 Tolson Banner is a writer and columnist. A Vietnam War Veteran & POW Battle with Brain Cancer comes to an end. In honor of a fallen officer and dedicated humanitarian. I must say that Senator John McCain will be missed. His training as a military officer, his presence, knowledge and experience is not something that can be so easily replaced or recreated. It takes a man with this kind of diligence one who has actually been a prisoner of war. To stand on the green carpet and speak up for the Vietnam Veterans. Senator McCain understood the need of having bills related to those who have served the United States passed. It was important to help them to be able to take care of themselves, to be made whole. It is unfortunate our government is still denying soldiers the relief they deserve. Senator John McCain was a captured POW one of the few men able to speak on the sufferin the Vietnam Veterans had to endure. 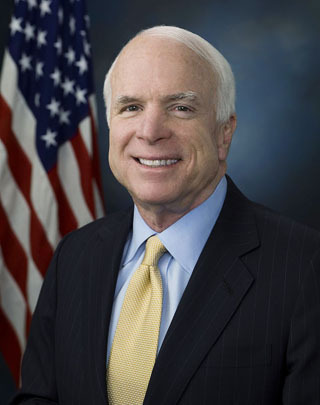 Senator John McCain was captured by the Vietnamese and placed in solitary confinement in Vietnam. Prior to being placed in solitary confinement as a POW Senator McCain requested the release of the POW’s with him. This request led to unwarranted attention being placed on him. Which also led to him being forced into solitary confinement for two years. Senator John McCain was continuously tortured beyond imaginary beliefs. He was denied medical attention. Regardless of whether Senator McCain was a Democrat or Republican it really doesn’t matter we must look at the man and the work he has put forward to make this world a better place for all. What we as a nation of people must look at is the concept of freedom and what this great nation America stands for. What is the right thing to do to move this nation forward. From a more personal stand point I saw Senator McCain’s viewpoints on many issues especially on those concerning the Vietnam Veterans as an equalizer for justice. Senator McCain’s service in the military and government helped to prepare him in his leadership roles for the progress of this nation. He gave of himself which is something others are not willing to do. He invested his time and effort for change. He denied himself time with family, friends and loved ones for the benefit of the United States of America. His military record speaks for itself In March 1973, after years of torture, McCain and other POWs were released. He later received the Silver Star, Bronze Star, Purple Heart and Distinguished Flying Cross. His time in government remain impeccable. The 8th Ward looks disgusting, and we can prove it. Don’t believe it? Drive up and down its main streets. Ald. Michelle Harris is helping the area plunge down into a slum by allowing businesses to come in that prey on the poor all the while attempting to transform the 8th ward and its communities into a slum to inevitably help and allow strangers to come in and buy for pennies on the dollar. In the meantime, your property values will go down and crime will go up. Within the slums she builds and cultivates is one of the most affluent black communities in Chicago known as Pill Hill. Once a very wealthy black community, her reign has littered the surrounding area with deteriorating businesses and vacant property leaving the area only desirable for blood-suckers and exploitative businesses to come in, including her tower of Babel that pitted the communities against each other; thanks to her forked tongue delivery of the project and its component known as the Montclare, a low-income senior housing project that she was able to get the go-ahead from the city to allow construction. It will be her testament to her tenure and the ornament that shines in the middle of the devastation created under her watch including dialysis centers, organ donation facilities, businesses that buy blood from our young, businesses that can fence merchandise stolen from our neighbors, cash advance, storage units for people to store and many will eventually lose what they have due to discrimination and unemployment. To add insult to injury, Ald. 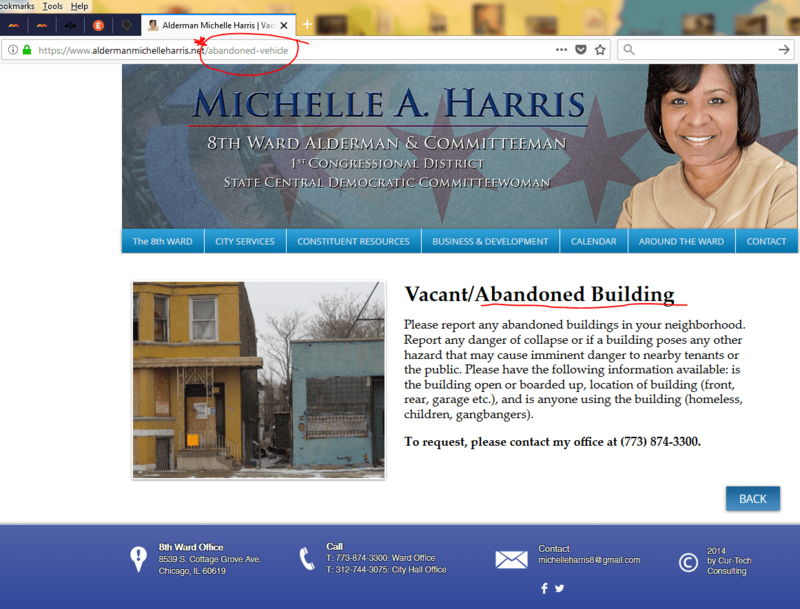 Harris has changed the report abandoned vehicles page on her website to report vacant/abandoned buildings, instead of adding a new page to report abandoned buildings. Is this an attempt to look like she was concerned about the abandoned buildings all the time by editing an existing page so it wouldn’t look like a new page? So much for reporting abandoned vehicles! This is just one example of the deception that constantly takes place when her ineptness is exposed or feels her position (she calls it a job) is threatened. It’s obvious she was shamed into looking as if she was concerned about it all the time, when she was not, yet she was tooting her own horn all over the place about how she was building the 8th Ward up with a low-income housing project in a middle to upper- middle class community. What a joke! 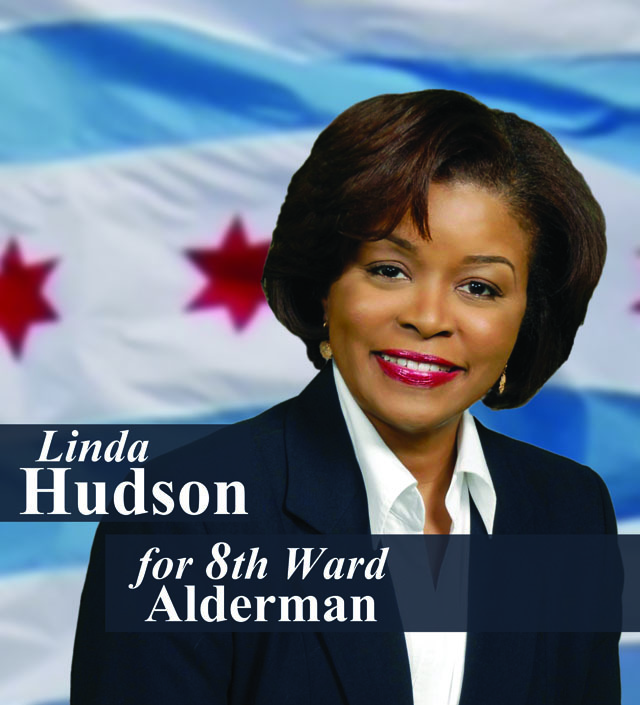 We saw all of the pictures of the slums and lack of maintenance on empty and abandoned buildings, some in deplorable and dangerous conditions as well as severely broken sidewalks and filthy streets being shared on the Citizens for “Linda Hudson, 8th Ward Aldermanic Candidate’s” Facebook page, and obviously she and her staff did too. While they are half hanging street cleaning signs, the Department of Streets & Sanitation is coming through every month cleaning streets and ticketing the cars of people that didn’t see the signs because they weren’t placed properly where they could be seen. There was a time when residents didn’t get tickets on their street, the sweeper just went around and you you’d lose out on the cleaning. Ald. Harris, please, for the well-being and sake of the community, step down as alderman. It is obvious you haven’t been a good caretaker for the ward. You’re in over your head – no creativity, no ideas, no vision, and nothing for the 8th ward but blight. NOTE: Click on first image and use left & right arrows to navigate gallery. When we think about crossing over to the other side. Leaving this world in spirit form where our soul returns back to the one and only creator of life, God. Many of us have had the opportunity to be blessed with the chance to see the Queen of Soul Aretha Franklin either in church or in concert. Through the years Aretha has entertained us. By gracing us on stage with the lovely and unique voice she was blessed to entertain us with. Her music was shared with the world which involved different occasions, happy, sad, subtle and heartbreaking love. Many of her songs reminded me of family fun when I was a child watching my mother and uncles and aunties dancing in the living room at my grandmother’s house. I am certain there are so many of us irreguardless of color who can relate to those precious moments. Aretha Franklin shocked the world when she demanded her(Respect) R.E.S.P.E.C.T. a major hit and every household throughout the United States was playing it. Let’s go back for a moment as I take you a little further down memory lane when Aretha blasted the world with Ain’t No Way. There was just no stopping The Queen of Soul as she went into demand filling concert hall after concert hall. You can bet there would be a sell out on all tickets with Aretha Franklin’s name posted at the top of the marquee. 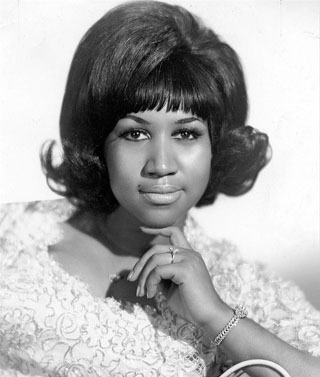 Although she was the Queen of Soul Aretha Franklin was discovered in church. Where she started as a gospel singer, I can still close my eyes and hear her singing Amazing Grace, I’m Climbing Higher Mountains, Precious Lord. Yes we all loved her and you have to admit she still holds the title The Queen of Soul. Mrs. Aretha Franklin continued to challengw herself through the years. A Queen amongst Queens there was no task she was afraid to meet and complete. Don’t forget Natural Woman, You Send Me; 3.The Weight; 4. Baby, I Love You; 5.Do Right Woman; 6.Chain Of Fools; 8.My Song; etc. She let us into her life and shared her love for music with the rest of the world. Aretha Franklin gave us “I Say A Little Prayer” Now we must all say one for her and give thanks to the love, happiness and joy she brought into our homes, businesses, streets, club’s and churches. And we all danced to the unique tunes of Aretha Franklin. She is now being laid to rest and her journey on this earth is complete. A legend in her own time. You should sit back and play this song “Gotta Find Me an Angel.” Because one of our Angels has just flown away. Thank you Aretha for all the love you shared with us through the years. Springfield, IL – What does it mean to blaze a trail? To the Illinois Department on Aging (IDoA), blazing a trail means evolving to better meet the needs of our growing older adult population and creating a sustainable path for older adults in Illinois – today and for many more years to come. As we celebrate Older Americans Month, IDoA is embracing this year’s theme – Blaze a Trail – and using it as our call to action. “Older Americans Month is an important month for us to celebrate the contributions of older adults and raise awareness about the issues facing our community,” remarked IDoA Director, Jean Bohnhoff. “We’re being challenged to keep pace with technology and a growing aging population; the Department is meeting that challenge head on and, working with the Rauner Administration, we believe we’ve found the right solution to avoiding premature institutionalization while maintaining the sustainability of critical programs,” she continued. Director Bohnhoff is a trailblazer in her own right, coming from the provider community and joining IDoA earlier this year. She encourages IDoA staff to think outside the box and develop innovative and creative new ways to interact with providers and advocates across the network and improve service delivery for our clients. IDoA recognizes the contributions of local trailblazers year-round through awards programs such as the Senior Hall of Fame and our Caregiver Awards. “Blazing a trail means taking action, moving forward and paving a way for others to follow. We’re doing that at IDoA and we’re optimistic about what that means for our state and our older adult population,” said Bohnhoff.